Despite the UK cycle market being largely sports-based (or maybe because of that fact) the sector largely operates outside of the not-actually-all-that-different UK outdoors market. A quirky consequence means that some mayor players enjoy, perhaps bafflingly, a big profile in one and a small profile in the other. Enter Lyon Equipment: Pitched as one of the UK’s leading outdoor equipment distribution companies, the firm is no small upstart. It’s based in the Lake District, the heart of the British outdoor world – and an area that is hardly a stranger to cycling with countless shops and hire companies on the doorstep. Lyon’s been established for 50 years and has steadily grown in size and stature. Employing over 80 people and with a turnover exceeding £18m, Lyon Equipment moved into a new state-of-the-art facility in 2012, containing showrooms, marketing and administration offices, manufacturing and warehousing all in one site. In addition to its distribution business, the Work and Rescue division provides equipment, training and certification for people working at height and for rescue teams. Lyon Equipment is keen to point out that there are only a few outdoor retailers that do not stock products from a brand it works with. But regardless, the company is relatively unknown in bikes; a situation that is about to change as Lyon Equipment ramps up its activity in this sector, it promises. So, how is Lyon Equipment going to make good on that promise? The company is planning for growth in the cycle world by widening its bike-related product portfolio and investing in resources. 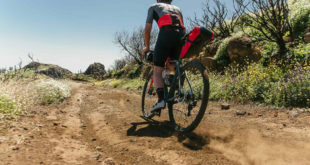 Lyon is the long-established exclusive distributor of Ortlieb waterproof products and Tubus bike racks has recently announced the appointment of Nils Amelinckx as its dedicated cycle sales rep covering the UK and Ireland. Lyon Equipment’s status in the outdoor industry bodes well for its cycle trade ambitions, the firm says. “Our existing retail partners know that working with Lyon Equipment is like having a virtual stock room,” says Frank Bennett, sales and marketing director. Lyon Equipment’s self-stated mission is: “To provide equipment and expertise for people to venture further” and it promises that statement will apply equally across cycle and outdoor.